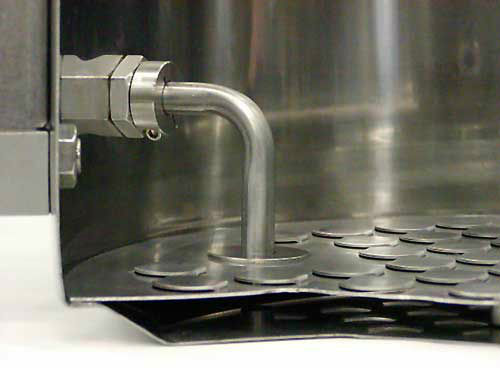 This is the unique Blichmann Boilermaker stepped false bottom shown installed in a cut-away pot. 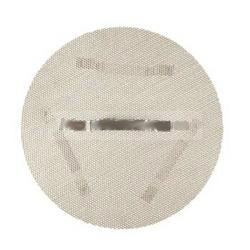 This patent-pending button louver false bottom is a hybrid of a perforated screen and a slotted manifold. The result is a false bottom that lets less husk matter through than other designs. at any temperature a breeze. - Subscribe to the Grainfather Youtube channel for a great assortment of videos. 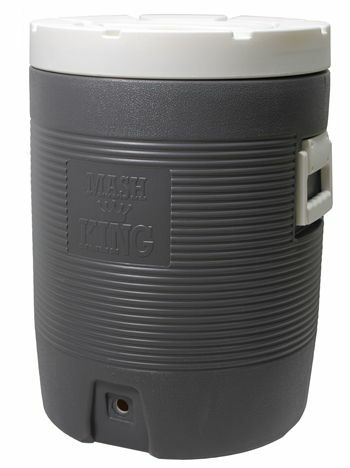 The Mash King Tun is a supersized 11.7 Gallon tun (43 Liters) beast! The 17% volume increase over traditional coolers ensures you can brew what you want, when you want it. Specially built and designed to handle the largest grain bills you can throw at it. Brewing a 1.09 original gravity brew? The Mash King Tun will easily handle it. Used for straining hops in a boil. Can also be in a mash tun instead of false bottom. 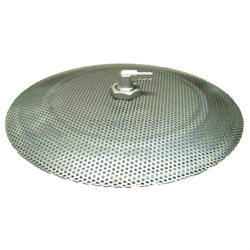 This false bottom is designed to sit above the spigot of the 8 gallon Heavy Duty Kettle for easy wort removal. These bottoms are sturdy and will allow you to turn your kettle into a mash-tun, or you can use it as a screen to filter out whole hops. Constructed from type 304 stainless steel with 3/32 perforated holes on 5/32 centers. They come with welded on stainless legs (1.75" tall) and a handle for easy removal. Has a diameter of 14 1/8 inches. 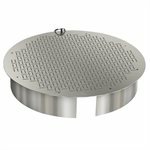 12" Diameter Stainless Steel Domed False Bottom. 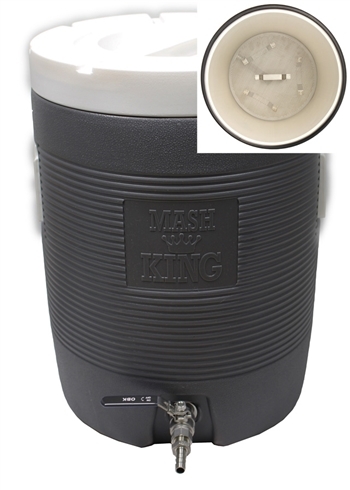 Convert a brew pot or cooler into a mash tun. Fits any of our 9, 15, and 19 gallon brew pots. Also fits in 10 gallon Rubbermaid coolers (very tightly). Constructed from 304 stainless steel these false bottoms will not float. Dome height is 1/2". Comes with 3/8" barbed 90° stainless steel elbow hose fitting in the center to draw the wort from beneath the dome. What size false bottom? A Domed False Bottom seats differently then a straight walled one. The outside dome sits on the bottom and acts as the seal to stop grains and hop material from getting through. As long as your inner diameter is longer then the length of the false bottom (distance across the inside) it will work. False Bottom's are a popular filtering system for keggles, coolers, and pots. For insulated 5 gallon beverage containers, or any container with at least a 9" opening at the top - such as a bucket. Made from stainless steel with 3/32 perforated holes on 5/32 centers. The barb fitting is 3/8 inch.